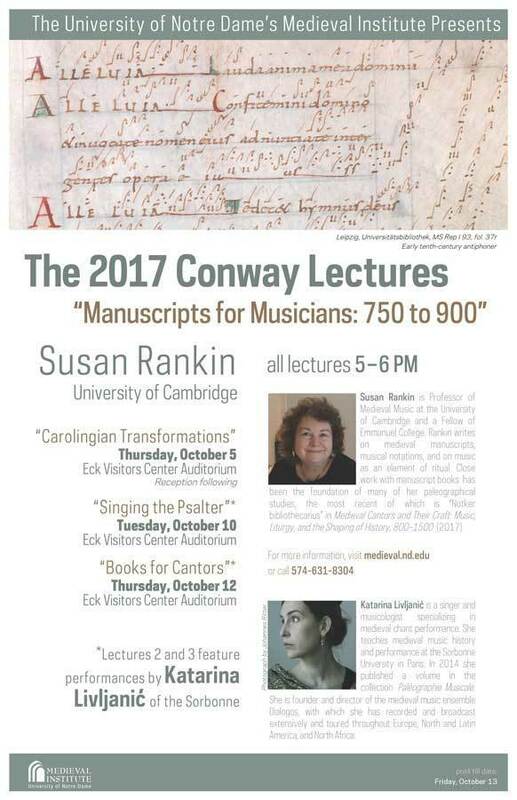 This year’s annual Conway Lecturer, Susan Rankin, Professor of Medieval Music at the University of Cambridge, will deliver a lecture series entitled “Manuscripts for Musicians: 750 to 900.” The lectures will be held at the Eck Visitors Center on October 5, October 10, and October 12. A reception will follow the first lecture, and performances by Katarina Livljanić of the Sorbonne will accompany the second and third lectures. Susan Rankin is Professor of Medieval Music at the University of Cambridge and a Fellow of Emmanuel College. A student of Michel Huglo, Rankin studied almost entirely in Paris and writes on medieval manuscripts, musical notations, and on music as an element of ritual. Close work with manuscript books has been the foundation of many of her paleographical studies, the most recent of which is “Notker bibliothecarius” in Medieval Cantors and their Craft: Music, Liturgy, and the Shaping of History, 800-1500 (2017). Katarina Livljanić is a singer and musicologist specializing in medieval chant performance. She teaches medieval music history and performance at the Sorbonne University in Paris. She has been invited as visiting professor or artist in residence at different universities and festivals worldwide, including Harvard, Wellesley College, the Early Music Festival in Utrecht, and the Flanders Festival in Antwerp. In 2014 she published a volume in the collection Paléographie Musicale. She is the founder and director of the medieval music ensemble Dialogos, with which she has recorded and broadcast extensively and has toured throughout Europe, North and Latin America, and North Africa.